A gentle, intelligent portrait of the Virginia site that has become a national shrine where members of the armed services are honored with dignified tradition and carefully honed ritual. 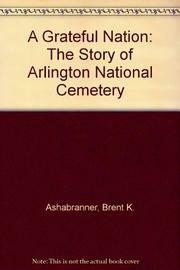 Surveying the cemetery's history, Ashabranner enlivens his story with telling facts. The property came to Robert E. Lee through his wife, Washington's step-great-granddaughter; it was confiscated, through a legal ruse, during the Civil War (in 1883, the Supreme Court awarded Lee's son $150,000 compensation). A cemetery was urgently needed for the Union dead, but burying them around the Lees' home was also an act of vengeance, Later, Confederate soldiers were also buried at Arlington; at first they were denied flowers, but even that symbolic retribution was revoked after a strong wind redistributed blossoms during the night after the first Memorial Day, in 1868, suggesting reconciliation as a better policy. Ashabranner interviews people at Arlington (a sergeant who plays taps at funerals, men who train the horses, a landscaper, a guard at the Tomb of the Unknown Soldier) and depicts its daily and annual events and ceremony. His daughter's b&w photos nicely complement the text, dramatizing the range of events that occur there. Well-crafted nonfiction that gives insight into how a well-established institution evolves through the interaction of history and more personal events.